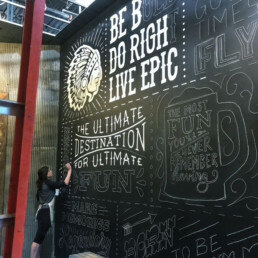 Lisa Quine is a Creative Consultant specializing in lettering and murals from Cleveland, Ohio. Her work is so amazingly beautiful and detailed. She began her career in the fast-paced world of advertising. But after five years in the industry, she made the decision to leave her full-time role as an Art Director to pursue her own freelance business. Since then she has been recognized internationally for her work and was chosen to represent Cleveland to paint a mural in France. Thanks so much for chatting with us Lisa! I’m a Creative Consultant with a focus in lettering and murals. I grew up watching every Disney VHS and DVD I could get my hands on, including behind the scenes footage of how the illustrators and animators worked. After seeing that the Disney “imagineers” got to draw real life lions in the studio for my favorite Disney movie, The Lion King I definitely wanted to do that! I started hand-lettering lyrics for fun in a personal journal and would occasionally post the good ones on Instagram. Once my friends, family, and coworkers saw what I was doing, they started hiring me for little commissions and my side hustle gradually grew from there. By posting lettering work consistently I started attracting bigger companies in the Cleveland area. In December of 2017, I was hired by an interior design firm to paint 6 walls on 3 floors in their client’s new headquarters. Because the timeline was so aggressive, I couldn’t complete the project working 40 hours a week at an ad agency, so I took this as a sign from the universe that it was finally time to quit my day job and pursue a freelance career. I made sure I had 5 months of living expenses stashed away in the bank just in case it didn’t work out, but luckily I never needed it. I’m always grateful that Cleveland is a big city that feels like a small town. My first project as a freelancer was the 6-wall mural that I just mentioned, and that led to two more mural projects before I even finished the first one! The office was under construction with a number of different vendors around getting ready for the grand opening. They saw what I was doing and wanted murals in their office space too. Besides the networking that has resulted from client referrals, I also try and be someone that clients want to work with. I genuinely love what I do and present my work with passion and enthusiasm which helps attract the right clients. Showing up to networking events has been helpful too because I can talk about what I do right then and the and market myself with my portfolio in my pocket on Instagram. I’ve gotten two mural projects recently from using this tactic at an event two months ago. It works! When lettering was just a hobby I did after work back in 2014, one of the ACDs that worked at the same ad agency as me saw my lettering and had me hand-letter headlines for a local cemetery campaign. (Yes, a cemetery, but Lake View Cemetery is like another park here in Cleveland, rather than a final destination.) That’s when things started to feel a lot more serious because then my lettering started living out in the real world and not just Instagram. I sort of stole this from an interview with Beyoncé, but I LOVE it. “Every opportunity I have I want it to be phenomenal” If I pour my whole heart in to each project I commit to, the better my portfolio will be, and the greater my next opportunity is. I genuinely love what I do which makes working on projects everyday something I look forward to rather than slack off on. If I don’t see myself getting excited about an opportunity I won’t commit to it (which is something I’ve learned the hard way). So by being picky with projects, it helps build my drive and motivation to work on them. I’m currently wrapping up sketches and mockups for 5 storefront temporarily murals. Pinecrest is a new shopping center outside of Cleveland that has hired me to create Instagram-worthy murals to be painted on windows of vacant store spaces. I’m really excited because this will be the brightest and most colorful palette I’ve worked in! I’m also working on personal pieces for an art show in Athens, Ohio all based on indie/emo music I listened to in high school and college. I’m really, really excited for this one because it’s the most detail I’ve illustrated in my lettering to date. If I pour my whole heart in to each project I commit to, the better my portfolio will be, and the greater my next opportunity is. My dream project would probably be to paint an entire room, floor and ceiling included. I’ve already painted a whole lobby before and I loved the feeling of standing in the middle of it and being surrounded illustrations and lettering. I want to take that experience and push it even further! The most shocking thing about freelancing to me is how 90% of it is all in the mind! When I first started out, I listened to all the trendy non-fiction audiobooks and podcasts I could to help with the business side of the freelance world since I had no experience or training being an entrepreneur. My main takeaway from all of that was how I was the one who was really in control of whether or not I was going to be successful. Having the right mindset throughout each step of a project is the key—from attracting the right clients with work that you want to be working on, to reflecting on each project after its completion so that you can grow from the experience. Meditation on the regular helps too! My favorite and most useful piece of advice came from my favorite book, The Subtle Art of Not Giving a F*ck. In the book, the author discusses how resilience, happiness, and freedom come from knowing what to value most in life, and more importantly, what not to. If time is our most precious gift it’s so important to use it wisely and let our values be the guiding light. I failed hard when I had my second career art show. I met a gallery owner who was kind enough to let me have a solo show for a month. I tried to do too much work and too much experimentation in a short amount of time and it was a total flop. It taught me how to schedule out projects correctly so that the end result is something I can be proud of. It also taught me to use what makes my artwork successful and build on it rather than create something totally new. When another art show opportunity popped up a couple of months later, I was ready. I created more work, stuck with a style and color palette that I was more comfortable working in, and kept things a lot more simple. My work sold like crazy after the opening and I had to stop selling pieces with the frame included because I was making too many trips to the show location to restock! (I also raised my prices.) Lesson learned. My most proud moment was being chosen to represent the city of Cleveland for a mural project in Rouen, France, Cleveland’s sister city. To celebrate 10 years of being sister cities a French artist came to Cleveland and painted a mural for a couple of weeks, and now it was my turn to go over to France. I never, ever, EVER thought I would travel to another country for work. I got to collaborate with two talented street artists in Rouen to paint a colorful mural on the side of a handball gymnasium. Taking what I learned from my subpar art show, I stuck to what I was confident in and what I enjoyed working on and painted giant vintage-inspired typography that read “All colors are beautiful.” It even led to an additional project for a hotel in Rouen! I love to listen to podcasts and audiobooks while I work because it keeps my motivation up. Currently, I’m listening to the books Braving the Wilderness by Brene Brown and Everyday Millionaires by Chris Hogan. The School of Greatness podcast along with TED Radio Hour are my podcast go-to’s. Artistically, William Morris is my current obsession for detail-oriented work. I almost had a heart attack in an H&M store when they came out with a line of clothes with his textile designs on them! SO RANDOM. Two very different worlds of mine colliding. Inspiration explosion ensued. I bought a pastel pink denim jacket and drew my Lisa Quine logo on the back of it so when I’m painting murals people can read my name. It’s a little bit of fashionable self-promotion! According to my husband (shoutout to Mark) it’s strange that I’m such an upbeat, happy and bubbly person who is obsessed with listening to the saddest music (cue any Elliott Smith song). I’m on Instagram 24/7! @lisa_quine—I love DMing with people to talk business, lettering, or all things pop culture.